In stock now for just £105.99 including VAT! Hurry while stocks last! The Vicenza LED Illuminated Mirror With Demister Pad & Infra-Red Switch is a stunning addition for any bathroom thanks to its ultra-modern looks, stylish cubic design and its array of 48 LEDs. This beautiful mirror would add light, style and sparkle to any home. Highly popular among our customers thanks to its unique blend of style and fantastic value, this high-quality mirror is backed up by a 5 year guarantee, providing added peace of mind. With superb features such as an inbuilt de-mister pad and an infra red switch, this mirror really is the total package. Eye-catching, memorable, modern and stylish - the Vicenza is the ideal focal point for your bathroom. 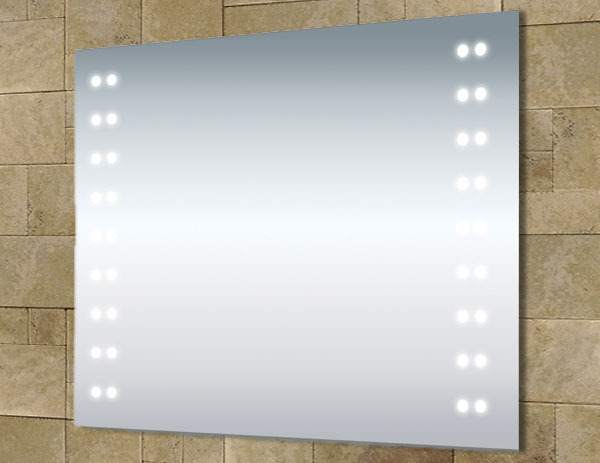 The Vicenza mirror is a stylish mirror featuring 48 LED lights which are operated using an infra-red switch, the mirror also features a de-mister pad. The LED lights fitted meet all applicable British Electrical Standards and they are arranged in 2 lines at either side of the mirror. The safe and easy to use infrared switch enables the user to activate the lighting with a simple movement of the hand under the sensor, no need for an unsightly pull cord or finger marks on the mirror. The demister pad will ensure steamy bathroom mirrors are a thing of the past. The heated demister pad will heat the mirror to a few degrees above room temperature within 2 -3mins, preventing the mirror from misting. The demisting effect will spread approximately 10-20% further than the pad itself. The Vicenza mirror is IP44 rated suitable for bathroom zones 2 and 3. This means the mirror can be fitted in area where it may be splashed, anywhere within 0.6 metres of a basin or similar water source. The mirror measures 500 (h) x 390mm (w) and is accompanied by a superb 5 year guarantee as standard, which is a testament to the outstanding quality of this item.